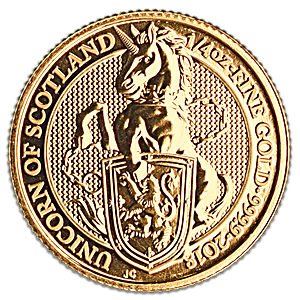 1/4 oz Queen's Beast Unicorn gold coin minted by the Royal Mint. The Queen's Beast Unicorn is the fourth of ten coins in the Queen's Beast Series, a series that features the heraldic beasts that stood guard at The Queen's coronation. The fourth beast is "The Unicorn of Scotland". From the end of the 16th century, two unicorns were adopted as the supporters of the Scottish Royal Arms. In 1603, the crown of England passed to James VI of Scotland, who then became James I of England. He took as supporters of his Royal Arms a crowned lion of England and one of his Scottish unicorns. The unicorn holds a shield showing the Royal Arms of Scotland, a lion ramping in a royal tressure, adorned with fleur-de-lis. Each 1/4 oz gold Queen's Beast Unicorn is minted in .9999 fine gold. The Queen's Beast Unicorn is legal tender at £25.